VANCOUVER, BRITISH COLUMBIA–(Marketwire – Jan. 27, 2010) – Oro Gold Resources Ltd. (“Oro Gold”) (TSX VENTURE:OGR) reports assay results from recent drilling on its 100-per-cent-owned Trinidad property in Sinaloa, Mexico. 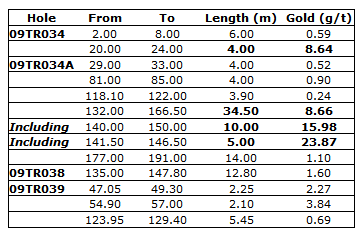 Results from hole 34A confirm high-grade gold in the HS zone and indicate potential at depth. An additional 3 holes indicate potential for shallow high-grade gold in the Taunus pit area, as well as additional potential in the Eldorado South zone. Hole 34A was drilled in order to collect a representative sample of the HS zone for metallurgical analysis and to test for deeper gold potential below the HS zone. The diamond drill hole intersected 34.5 metres of 8.7 g/t gold. This interval includes 5.0 metres of 23.9 g/t gold (or 10 metres of 16.0 g/t gold). These internal composites represent some of the highest gold values reported to date and occur in an interval with good core recovery (greater than 90%). The lower portion of the interval had less than optimal recovery (see attached figure for detail). Hole 34A is the deepest hole in the HS zone. The hole penetrated over 40 metres of conglomerate below the HS zone and then intersected a pyritic lithic tuff. The presence of alteration below the conglomerate indicates potential at depth. – Hole 34, north of the pit, drilled from the same location as 34A and was a shallow hole to test near surface potential. This hole intersected 4 metres of 8.64 g/t gold at a depth of 20 metres, indicating potential for additional near surface gold resource above the HS zone. – Hole 35 was not sampled due to drilling issues and was replaced by hole 38. – Holes 36 and 37 were drilled from the same location north of the pit and were abandoned prior to reaching target depth due to difficult ground conditions. – Hole 38 (re-drill of hole 35) intersected 12.8 metres of 1.6 g/t gold in the area of the Eldorado South zone. – Hole 39 intersected several anomalous narrow gold intervals indicating additional potential in the Eldorado South zone. To date approximately 8,500 metres in 39 diamond drill holes have been completed at the Trinidad project. This drilling has defined several significant gold-bearing zones at Taunus including the HS, Taunus South, and Eldorado South zones. (5) initiating regional exploration on Oro Gold’s other gold properties (over 2,000 square-kilometres) located outside of the Trinidad district. The Taunus gold target area is located on the Trinidad property in an 80 kilometre-long, northwest-trending structural corridor in what the Company references as the Trinidad district. The Taunus gold deposit is interpreted to be hosted in a local pull-apart basin situated in the larger Trinidad district structural corridor. Mineralization at the HS Zone within the Taunus gold target is interpreted to be an oxidized, low-to-intermediate sulphidation, epithermal vein system. The mineralization is characterized by multiphase stockwork veining and hydrothermal brecciation hosted in both clastic, porphyry intrusive and andesitic units. Oro Gold has identified 10 other gold targets within the 650-square-kilometre Trinidad district that it will be exploring over the next season. The Trinidad project exploration is under the direction of Frank Powell, Executive Vice President Oro Gold Resources Ltd. Gary Lustig, P.Geo., a qualified person as designated by National Instrument 43-101 has reviewed the technical content of this release. Thorough quality assurance and quality control program (QA/QC) protocol was utilized on the project including duplicate, blank and standard samples with each batch of assays. The core samples were submitted directly to Inspectorate de Mexico, S.A de C.V. for preparation in Durango, Mexico, and analysis in Reno, Nevada. Analysis was conducted on 1 assay ton samples with over 20% as QA/QC samples. Analysis of gold was by fire assay, with a gravimetric finish on samples exceeding 5 g/t gold. The gravimetric assay results were used for the reported composite intervals. Oro Gold reports that, subject to regulatory approval and pursuant to its Stock Option Plan, it has granted 850,000 stock options to directors and officers of the Company. The options are exercisable at a price of $0.44 per common share for a period of five years from the date of grant. Furthermore, Oro Gold announces that Dr. Dominique Fournier, VP Exploration of the Company, has resigned to pursue other endeavors. The Board of Directors would like to thank Dr. Fournier for his valuable contributions. Oro Gold is a junior gold exploration company with projects located in Mexico and Panama. The Trinidad gold project located in Sinaloa, Mexico continues to be the Company’s main focus of exploration and resource definition efforts. The Company intends to increase shareholder value through the discovery and definition of low-cost, quality gold resources on its advanced stage properties. Privacy Statement |© 2010 Marketwire, Incorporated. All rights reserved.